Amazon’s (NASDAQ:AMZN) longest Prime Day is expected to hit hard prominent retailers’ efforts to cash-in on the back-to-school season in 2018. Started in 2015, Amazon’s Prime Day offers special deals, including deep discounts on in-house products. Notably, the event is only open to members of the Prime subscription service, which has crossed more than 100 million of paid members globally (as of April 2018). Amazon’s Prime Day has been a success as it helps the company generate strong sales in a traditionally slower part of the year. Per Cowen & Co. and JP Morgan Chase analysis, quoted by CNBC, Amazon generated $1 billion in sales on 2017 Prime Day. Moreover, since 2017 Prime Day (Jul 10), Amazon’s shares have returned 70.6%, better than the industry’s rally of 39.1% and a host of competitors. We expect 2018 to be a no-exception, primarily due to growing number of deals (more than one million per Amazon). Moreover, Prime’s expanding international subscriber base is a key catalyst. Per MarketWatch, Prime members in Australia, Singapore, the Netherlands and Luxembourg will also participate in the event this year. August-September has been traditionally considered as the back-to-school season in the United States. The importance of this season lies in the fact that in terms of consumer spending it is second to winter holidays. According to Deloitte, 50% of school related annual spending happens during back-to-school season. Hence, retailers are eager to leverage the increased traffic to enrol customers into their loyalty programs that ensures revenue visibility throughout the year. However, Amazon’s Prime Day, which is held a month earlier, has disrupted this trend. MarketWatch cited data from Cardlytics 2018 Back-to-School Spend Report, which states that Prime Day has brought in a change in consumer behavior. Consumers now prefer to stock-up back-to-school season supplies a month-ahead to benefit from the deep discounts offered by Prime Day. The change in consumer behavior is also supported by RetailMeNot data. According to its latest survey, 91% parents surveyed are planning to do their back-to-school shopping on Prime Day and almost 40% of their planned spending is likely to be on back-to-school items. Although this trend doesn’t bode well for brick-and-mortar retailers, it is significant for Amazon. The company is leaving no stone unturned to lure back-to-school customers. It recently announced new Back to School and Off to College online stores. The lower-priced stores are expected to further drive traffic and sales. Moreover, Amazon has introduced an option to allow teens aged 13 to 17 shop independently on the Amazon app, under parental monitoring. Per MarketWatch, college students can also rent or purchase textbooks. How Retailers are Preparing to Counter Amazon? Retailers with compelling offers and deep discounts are expected to woo most of the back-to-school spenders, only if they offer it in early summer. Per Deloitte’s survey, 60% shoppers hitting stores before August are anticipated to spend an average of $532, 16% higher than the remaining 40% of parents who start shopping in August or later ($458). Hence, the July event has forced many retailers to match Amazon’s footsteps in offering back-to-school products. Prominent retailers like J C Penney (NYSE:JCP), Kohl’s (NYSE:KSS) and Walmart (NYSE:WMT) have taken a number of initiatives to attract the back-to-school traffic. Notably, J.C. Penny has partnered with Fanatics to launch Fanatics shops that sell licensed sports merchandise. Kohl’s has begun seasonal hiring much earlier at more than 300 of its 1,100 stores to support the peak shopping seasons. Moreover, eBay (NASDAQ:EBAY) announced an expansion to its price-matching program to more than 100,000 items across its marketplace, up from 50,000 items. Amazon’s aggressive retail strategy, expanding seller base and distribution strength will continue to benefit it in gaining traction in the retail space. Retailers are also preparing themselves to counter Amazon’s growing threat in every possible way. However, Amazon and the retailer tussle is ultimately proving beneficial to consumers, who are encashing the deep discounts and deals. 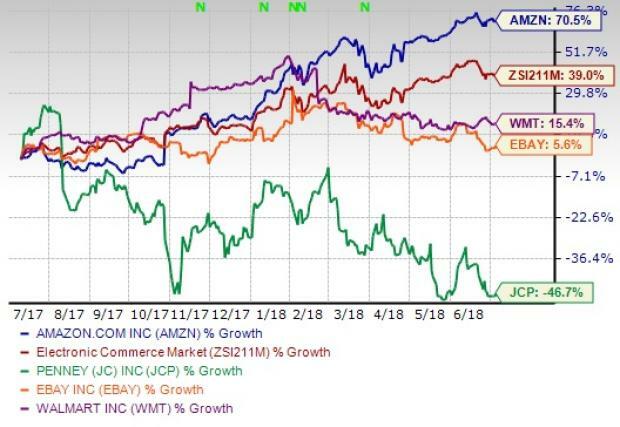 While Amazon, J.C. Penny, Kohl’s and Walmart currently have a Zacks Rank #3 (Hold), eBay carries a Zacks Rank #4 (Sell). Article printed from InvestorPlace Media, https://investorplace.com/2018/07/amazon-amzn-prime-day-hit-retailers-back-to-school-efforts-ggsyn/.